collaboration, a photo by mbp on Flickr. A couple of weeks ago, APQC hosted a very interesting and insightful twitter conversation in which I took part, on the topic of Collaboration. Q1: How do good organizations define collaboration? A1 The term is often used in undefined manner. lack of clarity can cause frustration with managers who view collaboration as “clutter"
It's one of those terms which nobody can argue against, but which nobody has really defined. The boundaries between collaboration, cooperation, alignment and teamwork are very fuzzy. Is working on a virtual team collaboration? Some would say so, some would not. Is putting your work products online for others to find, collaboration? Some would say so, some would not. If you are approach to drive collaboration in your organisation, one of the first things you need to do is define the scope. The definition in the second of the answers above is one of the ones I like best - the nature of "working across borders" separates collaboration from teamwork. Q2: What do your executives want collaboration to accomplish? A2 1,000 heads are certainly better than one, but you have to define - "better at what"? Q3: When do people most likely want to collaborate? I see three cases where people want to collaborate. The first is if they are assigned to a collaborative team, and given the role, the time and the challenge of working together with others to create something. The second is where they get direct benefit, for example when they can draw on the knowledge of others to help them solve a problem or plan an activity. The third is where they gain indirect benefit through helping others. By helping others to solve their problem or plan their activity, they gain profile and reputation, and "make a deposit in the favour bank". However, just as collaboration is not an end in itself, and some collaboration hinders rather than helps, not everyone needs to be collaborative all the time. There is a reason we work in silos - silos help get teh work done. They provide focus and structure. Part of the trick of becoming an effective collaborative organisation is knowing when to collaborate and when not. Q4: How can SharePoint be a positive or negative for collaboration? SharePoint is ubiquitous nowadays, and came with the promise of being collaborative software. Again, it all depends on what you mean by collaboration, and provided you are dealing with Information, document control and multi-authored documents, SharePoint is fine. If you want to go beyond that level of collaboration, then certainly in the past SharePoint has been very limited. Organisations have turned SharePoint 2007 into an effective collaboration tool after massive amounts of customisation, but out-of-the-box functionality has been very disappointing, when you compare it to purpose built collaborative tools such as Confluence and Jive. 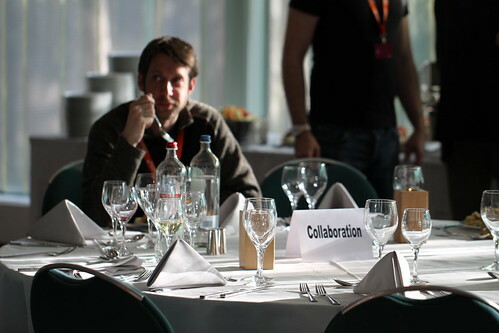 I would say that overall the ubiquitous presence of SharePoint has been negative to collaboration. It reminds me of the first few visits I made to Azerbaijan, when every car on the street was a soviet Lada. Certainly you can drive a Lada, but as driving experiences go, you would be far better off in a Range Rover or a Mercedes. This may all change with SharePoint 2013. I don't know it well enough yet to comment fully, but certainly the wiki functionality, at least, seems far better. Q5: How important are tools like Wikis, CMS, and Repositories to good collaboration? A5 the best collaboration comes through conversation, not through documents. It is the Behaviours that make for good collaboration. The tools can help. Collaboration requires more than a single tool, and more than a toolkit as well. 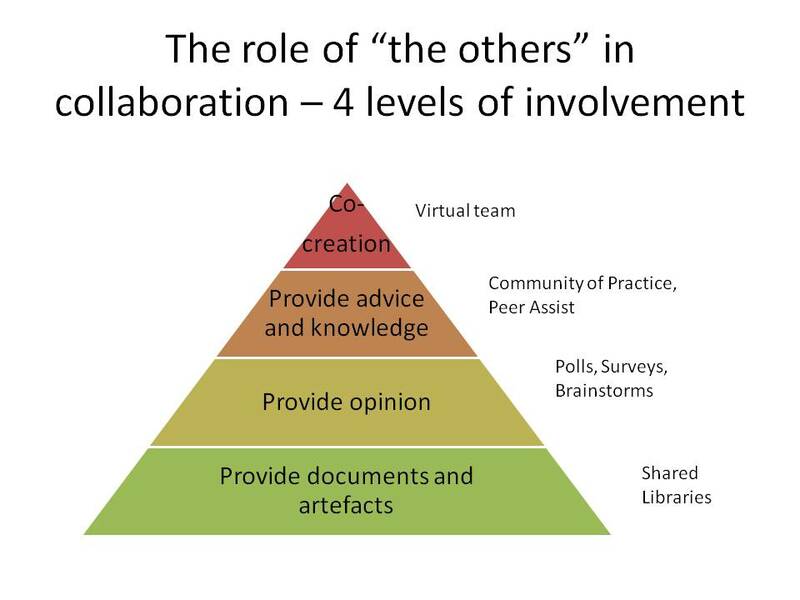 Like all forms of behaviour, collaboration needs a collaborative framework, of which tools play a part. Q6: What snuffs out collaboration? A6 Lack of time is only a symptom of wrong priorities. if it were a priority, we would find the time. I have talked many times on this blog about the damaging effects of internal competition. There are of course many cultural issues that can snuff our competition - we recognise 10 dimensions to a learning culture, which gives us 10 ways to kill collaboration for a start - but the two others I mentioned are important. I have been working with a company recently which has set up some excellent collaborative structures, but staff hit a brick wall when trying to implement what they have created. In this company, and in many others, collaboration is therefore seen as something "extracurricular". The "lack of time" argument is often quoted as one of the top cultural barriers. But in fact, it's not a question of time, it's a question of priority. Capturing and sharing and resusing knowledge needs to be seen as part of the job, not an add-on, and just as much a priority as many other management aspects of the way we work. Q7: What are key collaborative skills organizations can develop in employees?